Starting and maintaining wellness programs at work takes a lot of time and effort, but the benefits are absolutely worth it. 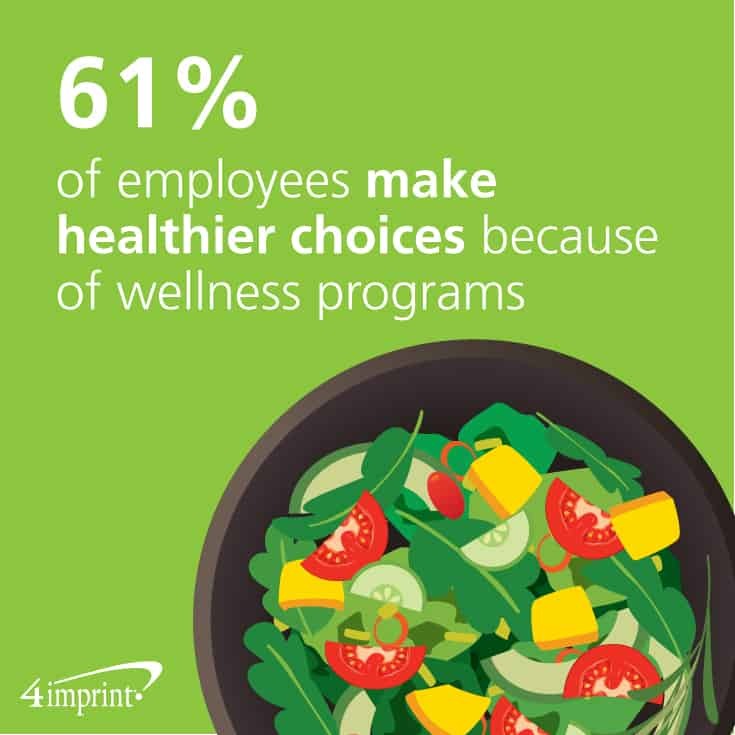 A study by the International Foundation of Employee Benefit Plans showed that wellness initiatives reduced health care costs in 56 percent of companies, improved employee engagement and reduced absenteeism in 51 percent. Forty-two percent found increased productivity. Employee wellness programs are great at getting people to make healthier choices—61 percent of employees do, in fact, according to the 2016 Aflac® Workforces Report. The benefits of workplace wellness are what drive 70 percent of businesses to offer programs, according to the Society of Human Resource Management. It’s also an important factor when recruiting and retaining top talent. When you’re promoting wellness in the workplace, you want to get people’s attention and get them on board with your program, and incentives can help you do that. 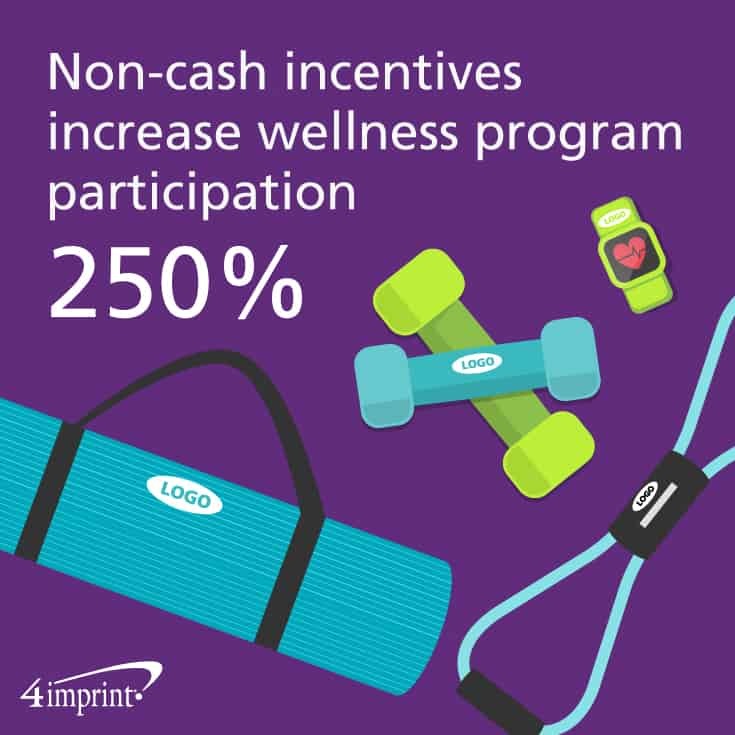 A MED-STAT study showed an almost 250 percent increase in participation when people received non-cash incentives, such as promotional products. 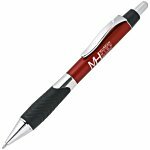 Need a great way to motivate your employees? Give them promo gear that aids them in their quest for fitness! Wearable fitness trackers can help people achieve their fitness goals in many ways, but these tools are underutilized by companies. 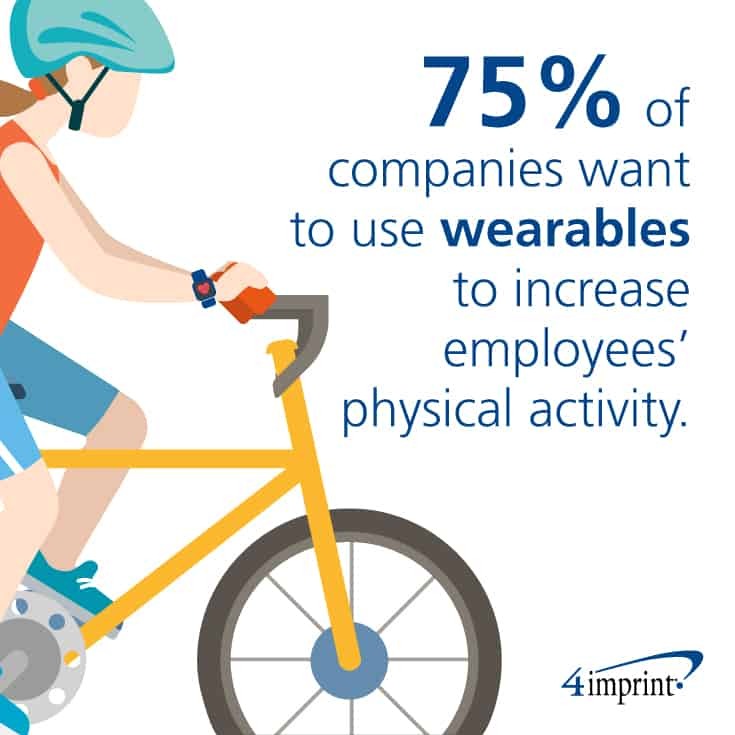 A survey by the Corporate Health & Wellness Association showed that more than 75 percent of organizations want to use wearables to increase their employees’ physical activity. However, only 35 percent of companies offered wearable devices as part of their wellness program. To get people out and about, start an individual or team walking challenge! Give all participants a simple pedometer and have them track how many steps they take over a week, a month, or an even longer period of time. It’s fun to compare how you or your team is doing to everyone else. For a more complete fitness tracking challenge, give employees a fitness tracker that will not only track steps taken, but also distance traveled, activity duration, calories burned and even sleep quality. Users can set personal goals, then send their information to an app on their phone or tablet and see their progress. People exercising 30 minutes a day, three times a week, are 15 percent more likely to perform their jobs better. That’s great news for everyone. But you don’t have to just walk, since there are many other activities to choose from. In many areas, cycling is a popular way to get fit. Encourage your employees to bicycle to work with an LED bike light that will help keep them safe as the sun goes down. Yoga is also a popular choice for wellness in the workplace, as it can help reduce stress and improve your mood. 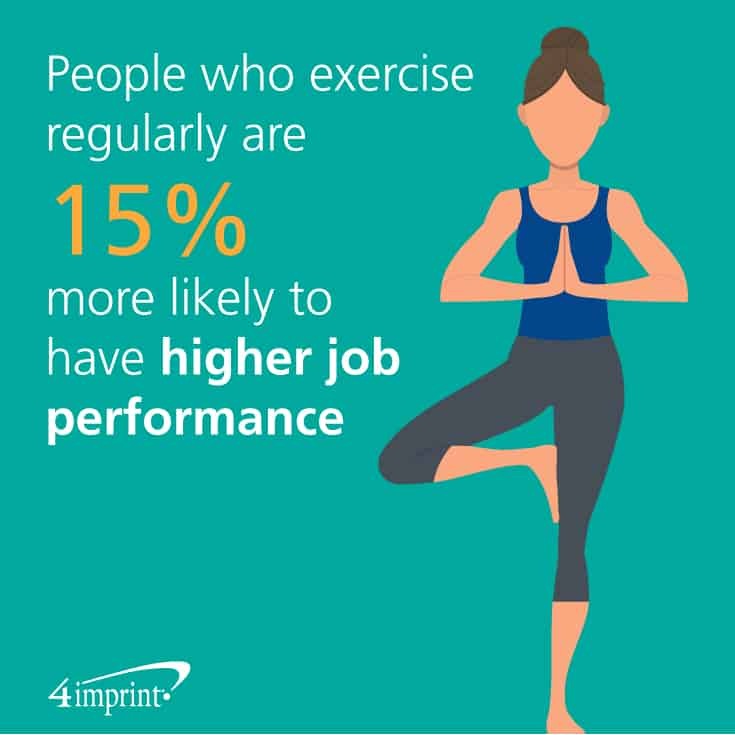 Handing out exercise mats to employees can encourage them to give yoga a try. And no matter what type of exercise people are doing to try to get fit, they may want some music to keep them moving and motivated. 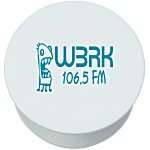 A logo’d set of earbuds with a handy ID case is just the thing for employees who want to rock out while they work out. No matter what’s offered by your program, everyone will eventually see the benefits that are delivered each and every day. Keeping your employees fit and feeling fabulous is great for you, and great for them! Trying to keep up with the latest workplace wellness trends? This Blue Paper® guides you through the hot up-and-coming trends for wellness in the workplace. Help your team better their health. 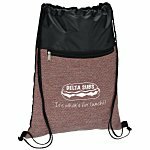 Encourage staff involvement in employee wellness programs by providing time for self-care and wellness giveaways.